Siemens Signia have been engineering hearing instruments for over 147 years. As a world leader in healthcare technology and hearing technology Siemens Signia is the premier solution for hearing loss. 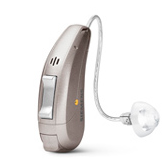 Siemens Signia Pure Primax is is a Receiver In the Canal (RIC) hearing aid. The Pure has consistently been our most popular best selling model. The Primax features are SpeechMaster, HD Music, TwinPhone and EchoShield. The Pure Primax is small and about 5mm longer than the tiny Ace Primax, but the Pure is feature rich and includes all the Primax features. It has a rechargeable option, e2e 3.0 wireless and Bluetooth capability. It covers a range from moderate to severe hearing loss. The free Siemens Signia TouchControl App for Android and Apple smart phones can be used to control your hearing aids. 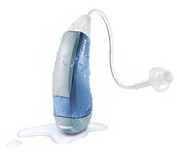 It is IP 67 rated, essentially making this hearing aid waterproof, sweat proof and dirt proof. The Pure Primax can be immersed in 1 meter of water for 30 minutes without damage to the instrument. The rocker switch allows volume, program changes and on/off function. The Pure Primax a tinnitus therapy feature. With the Siemens Signia EasyTek Bluetooth interface you can use the free EasyTek App to turn your phone into a remote control. 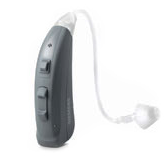 Siemens Signia Cellion Primax is is a Receiver In the Canal (RIC) hearing aid that is fully rechargeable and IP 68 rated waterproof hearing aid. Cellion contains all of the latest Primax technology, plus it is the world’s first lithium-ion inductive charging hearing aid. Cellion is truly a rechargeable hearing aid that will last at least 24 continuous hours after a two to four hour charge. After a short 30 minute charge it will last for seven hours. There’s no longer any reason to worry about having batteries on hand and unlike normal rechargeable batteries you don’t even have to change them after a year. The Cellion charger uses wireless inductive charging technology and you replace the battery every five years. There are no longer any contacts, so there is no concern about placing them correctly in the charger. The new shell design of the Cellion Primax is IP 68 rated which means it is almost impervious to water, dust and debris. The Primax features are SpeechMaster, HD Music, TwinPhone and EchoShield, e2e 3.0 wireless and Bluetooth capability. It covers a range from mild to severe hearing loss. The free Siemens Signia TouchControl App for Android and Apple smart phones can be used to control your hearing aids. The rocker switch allows volume, program changes and on/off function. The Cellion Primax has a new tinnitus feature. This proprietary and patented sound therapy is called notched therapy. Notched therapy has been shown to be especially effective for those who experience a tonal tinnitus. Signia Primax is the only major hearing aid platform to offer this unique and proven tinnitus therapy option. With the Siemens Signia EasyTek Bluetooth interface you can use the free EasyTek App to turn your phone into a remote control. Siemens Signia Insio Primax is a custom hearing aid ranging in size from the Invisible in the Canal IIC to the In The Ear ITE. Insio Primax offers a world’s first in advanced binaural directional technology for the tiny Inisible In the Canal IIC and Completely In the Canal CIC. The Insio has the new Primax features of SpeechMaster, HD Music, TwinPhone and EchoShield. High-Definition Sound Resolution allows these instruments to enjoy the benefits of automatic adaptive directionality in noisy situations. The free Siemens Signia TouchControl App for Android and Apple smart phones can be used to control your hearing aids. The Siemens Signia Insio Primax have e2e 3.0 wireless and are Bluetooth capable. With the Siemens Signia EasyTek Bluetooth remote you can use the free EasyTek App and have more control of your hearing aids. The free EasyTek App is available for Android and Apple smart phones. The Insio Primax fitting range can accommodate from mild to severe hearing loss. It can accommodate progressive hearing loss over time. Siemens Signia hearing instruments are always on the leading edge of quality hearing aid technology. 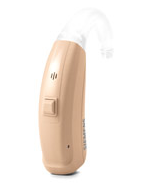 Siemens Signia Silk Primax is a new and convenient style of Completely in the Canal (CIC) hearing aids. Silk uses interchangeable domes to provide a unique fit, similar to Receiver and the Canal (RIC) hearing aids. It does not require an impression, so the user can be tested and fit with Silk Primax hearing aids in the same appointment. Silk incorporates the very successful Siemens Signia Primax technology that provides a very high quality of sound and ease of listening. Wherever there is a high level of ambient noise, a crowded store, a noisy restaurant, the office, or the car; any situation in which you are straining to hear speech. Silk Primax with Speech Master continuously monitors your environment separating speech from unwanted background noise. Primax gives you an effortless listening experience. It has Siemens Signia revolutionary binaural OneMic directionality not seen in any other CIC instrument, boosts the ears ability to focus on specific sounds and filter out unwanted noises from behind. Siemens Signia Silk Primax fitting range can accommodate from mild to moderate/severe hearing loss. It can accommodate progressive hearing loss over time. Siemens Signia hearing instruments are always on the leading edge of quality hearing aid technology. 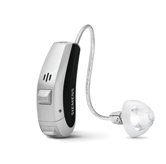 Siemens Signia Motion Primax is a Behind The Ear (BTE) hearing aid. This model incorporates all of the latest features of Primax technology, Speech Master, HD Music, Twin Phone and Echo Shield. Siemens Signia Motion also includes an 8 microphone directional system to ensure the best possible binaural listening performance, e2e 3.0 wireless and Bluetooth capability, ultra slim transparent ThinTube and has the option of using standard batteries or a charger. They are IP67-rated for resistance to moisture, sweat, dust, and dirt for greater reliability. The free Siemens Signia TouchControl App for Android and Apple smart phones can be used to control your hearing aids. All Motion models include a telecoil for better hearing in facilities with induction loops, such as places of worship, theaters, and public buildings. Motion Primax also includes a tinnitus therapy feature to provide relief from the irritating “ringing in the ears” of tinnitus. Hearing loss from mild to severe can be accommodated by the Motion Primax. With the Siemens Signia EasyTek Bluetooth interface you can use the free EasyTek App and have more control of your hearing aids. It is available in the 7px, 5px and 3px feature levels. 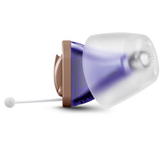 Siemens Signia Ace Primax is the smallest Receiver In the Canal (RIC) hearing aid available. 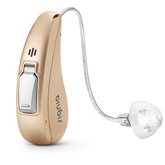 Its design makes it nearly invisible and its fitting range is appropriate for mild to severe hearing loss. The case of Ace Primax is only about 22 mm or .87 inches long. There is a trade-off for its small size. The Ace Primax does not have recharging capability, Bluetooth, e2e wireless or Twin Phone capability. It does include the new Primax features, SpeechMaster, HD Music and EchoShield. The Ace Primax can be controlled via a new touchControl App for Apple and Android devices. This App allows for volume and program changes and on/off function. This hearing aid is IP 67 rated, essentially making this hearing aid waterproof, sweat proof and dirt proof. The Ace can be immersed in 1 meter of water for 30 minutes without damage to the instrument. Ace Primax uses a standard size 10 battery. The pushbutton allows for an on-off function and program changes. It also has a tinnitus therapy feature. The Aquaris was the only hearing aid that has an IP68 rating and is a completely waterproof hearing aid, allowing continuous immersion in 1 meter (3 feet) of water. It is also dust proof, grit proof, sweat proof and shock resistant. It has a more powerful receiver for moderate to severe hearing losses and can be used with a standard tube and custom earmold or a slim tube paired with an ear dome or a custom earmold. Aquaris Micon uses a standard size 13 battery. Volume and program changes are possible with a remote control. Aquaris has a tinnitus control feature and it is Bluetooth compatible. Aquaris is not rechargeable. A BTE (Behind The Ear), Super Power hearing aid intended for use by those with moderately severe to profound hearing loss. Nitro can deliver up to 82dB gain. It has a Tinnitus therapy feature and a tele-coil for use with a telephone or looped hearing systems. Program changes and volume changes can be made via a rocker switch and pushbutton. These features and more can be controlled via the easyPocket remote or the miniTek Bluetooth remote. 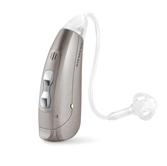 The Siemens Nitro Micon BTE is IP 67 rated, essentially making this hearing aid waterproof, sweat proof and dirt proof. The Nitro uses a standard size 675 battery. Also available in custom models from (CIC) Completely In the Canal to (ITE) In The Ear. Siemens Orion is part of the Essential level of Siemens technology. Available in both (RIC) Receiver in the Canal and (BTE) Behind The Ear styles. Both the RIC and BTE styles can accommodate mild to severe hearing losses. Orion combines smart technology with durability to provide a reliable listening experience. With essential features like a built-in telecoil, you can connect with telephones and listen in looped environments like places of worship, classrooms, and other public places. Orion’s nanocoated housing and IP67 certification combine with improved speech intelligibility and wireless connectivity. Tinnitus therapy feature relieves tinnitus symptoms and improves your hearing at the same time. Also available in custom models from (CIC) Completely In the Canal to (ITE) In The Ear. Sirion is part of Siemens Essential line of hearing aids. It is a BTE Behind The Ear hearing aid that can accommodate mild to severe hearing losses. Sirion has Siemens basic level of features. It is IP 67 rated, essentially making this hearing aid waterproof, sweat proof and dirt proof. It can be immersed in water 30 minutes without affecting the reliability and performance of the circuit. Also available in custom models from (CIC) Completely In the Canal to (ITE) In The Ear. Pure RIC offers a CROS/BiCROS solution for people with single-sided deafness. Pure RIC and Motion BTE offer the option for an environmentally-responsible rechargeable battery to eliminate daily battery hassles. It’s perfect for patients with dexterity challenges or those who have trouble seeing and changing tiny batteries. Signia hearing aids feature discreet remote control functionality from an Android or iOS smartphone. The Motion BTE has an option for direct audio input, making a great choice for those who need to use FM systems in classrooms or other public settings. Sivantos is committed to helping people with tinnitus better manage the condition. Many of their hearing aids, including all of the new Signia products, feature programmable tinnitus therapy sounds to help mask or habituate to the tinnitus. Your hearing care professional can help determine the best settings for you. Sivantos does not manufacture dedicated pediatric products. However, several of their models are equipped with kid- and baby-friendly features required by the best pediatric audiologists for their young patients. Examples of these features include battery door locks, tamper resistant volume controls and direct audio input for use with FM systems. Siemens has a long history of innovation in healthcare and their hearing aid legacy is impressive. Prior to the development of their current product lines, Siemens gained the loyalty of hearing care professionals and fit many satisfied hearing aid wearers with these digital products: Prisma, Signia, Triano and Micon.